Violent Series Deuce trigger for the DYE Reflex marker. This trigger is made of Delrin so it is super lightweight and very responsive. 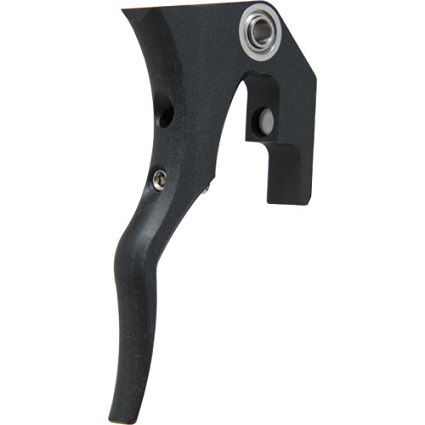 This trigger uses dual specialized flanged bearings with extended inner rings. The bearing flanges ensure that no matter how many cycles, or how hard the use, the trigger body will NEVER "walk off" of the bearing to bind on the sides of the grip frame. The extended inner rings work to position the trigger body precisely within the frame so that at no point in its travel is the trigger permitted to rub the frame. The front face of the trigger has a nice radius that runs down the full length of the trigger. The radius on the front gives you a nice feel and contact point with your fingers, not a flat front and corner edge like other triggers on the market.